What messages about teacher professionalism are transmitted through South African pre-service teacher education programmes? Promoting teacher professionalism is regarded as a strategy to address the disparate quality of learning in South African classrooms. Through a qualitative analysis of initial teacher education (ITE) programmes offered by five universities, this paper analyses the messages of teacher professionalism transmitted to pre-service teachers. Findings show that professionalism in teaching is variously conveyed to pre-service teachers as being located in their personal appearance and attributes; within their personal morals and shared ethical imperatives; in the kinds of workplace relationships they build, and in their use of formal knowledge for reasoned judgment in practice. The Specialisation Dimension of Legitimation Code Theory (LCT) (Maton, 2014) is used to show that when teacher professionalism is presented as highly individualised traits, the possibilities of developing shared knowledge-based teaching practices is reduced, and the importance of conceptually-informed judgments is obscured. This shuts down possibilities for systemic improvement. Conversely, if teacher professionalism is primarily located in what teachers know and can do with that knowledge, the social, moral and affective dimensions of teaching are underemphasised. Ideally, approaches to teacher professionalism ought to introduce students to teaching as a communally-owned practice, based on shared knowledge that enables reasoned judgment. The paper draws on the conceptual tools offered by LCT to suggest how social and epistemic relations can be weakened and strengthened to enhance the construct of teacher professionalism offered to prospective teachers through their ITE programmes. As in many other developing countries, South African teachers need to navigate the complexities associated with teaching in a rapidly changing, inequitable and largely under-performing education system (United Nations Educational, Scientific and Cultural Organization [UNESCO], 2014). Advancing teachers' professional development is one of four outputs envisaged by UNESCO's (2006) Teacher Training Initiative for Sub-Saharan Africa, and is widely regarded as one means of leveraging systemic improvements in the education system (Mukeredzi & Mandrona, 2013; Ndebele, Muhuro & Nkonki, 2016; Taylor, Van der Berg & Mabogoane, 2013). In legislation governing the provision of teacher education, teaching is conceptualised as a knowledge-based professional practice where "principles and theory are emphasised as a basis for entry into a professional teaching career" (Department of Higher Education and Training [DHET], 2015:20). A professional approach to the preparation of teachers is contrasted with skills-based approaches that produce "technicians who may be able to replicate performance in similar contexts, but who are severely challenged when the context changes" (DHET, 2015:9). Despite assertions in policy that teachers are to be prepared as prospective professionals, little is known about how Initial Teacher Education (ITE) programmes conceptualise teacher professionalism and seek to fulfil this mandate. To address this gap, this paper analyses the conceptions and enactment of teacher professionalism transmitted by ITE programmes at five institutions that participated in the Initial Teacher Education Research Project (ITERP), led by JET Educational Services. The findings show how messages about teacher professionalism are variously transmitted through ITE programmes as being about individual attributes, as being part of a community with a shared moral purpose, and as having shared knowledge, and being able to account for the pedagogical decisions one makes. I conclude by suggesting how teacher professionalism can be strengthened in ITE and the grounds of its legitimation made more explicit to pre-service teachers. A professional practice is classically understood as a collection of patterned actions that address a common endeavour, with action based on shared knowledge, skills and ways of thinking that can be taught and learned (Elmore, 2008; Gamble, 2010; Young & Muller, 2014). Because professional practices do not merely rely on intuition or common-sense perspectives, professionals need an extended pre-service education to acquire the necessary reservoirs of academic and diagnostic knowledge to make informed decisions when addressing complex problems that arise in practice (Abbott, 1988; Guile, 2014; Shalem, 2014), followed by an induction period as they enter the profession (Macbeath, 2012). They are accountable to peers in their practice for discernment and their ethical conduct. Any claim that teaching is a professional practice needs to encompass both a professional knowledge claim and a claim to moral knowledge concerned with maintaining the ethical standing of the occupation (Winch, 2004). A moral claim of teachers is proposed by Dunne (MacIntyre & Dunne, 2002), who argues that an 'internal good' of teaching is the ethical imperative to act in the best education interests of learners and their wellbeing. The professional knowledge claim has been bolstered through research into pedagogical content knowledge (PCK). PCK is broadly understood as the knowledge teachers use to transform their subject knowledge into appropriate representations that diverse learners will find understandable. Researchers such as Loughran, Berry and Mulhall (2006); Rollnick, Bennett, Rhemtula, Dharsey and Ndlovu (2008) have attempted to further theorise PCK. While efforts to pin down examples of PCK have been hampered by its topic- and context-specific nature, others argue that while teachers' topic specific professional knowledge can be codified, PCK is enacted in con-textually responsive ways (Gess-Newsome & Carlson, 2013; Park & Oliver, 2008). The professional status of teaching falls short if the list of traditional criteria is imposed on the work of teachers (Douglas, 2005; Elmore, 2008). In terms of the autonomy of professional practitioners, for example, there is contention around whether or not teachers are accountable to a professional body, or to the state (as their employer), to their institutions (as site managers), or to learners and their parents (as 'clients') (Gamble, 2010). Since Shulman (1987) identified the knowledge base that supports teachers' work, there has been a firmer base for recognising teaching as a professional practice. Teaching is recognised as intricate and unnatural work, requiring deliberate choices that are both conceptually-informed and contextually-responsive (Ball & Forzani, 2009; Morrow, 2007). On these grounds, teaching is accepted as a 'semi,' 'new' or 'proto' professional practice (Muller, 2009; Taylor & Taylor, 2013) in research and in policy. Professional teachers thus need to be educated (not merely trained), and should intentionally use a knowledge base to support their teaching practices (not merely indiscriminately apply a set of techniques and routines) within the contextual challenges of an emerging economy overcoming a legacy of inequality. It is necessary to distinguish between the professionalisation of teaching and advancing teacher professionalism internationally and in the South African context. Enhancing teachers' professionalism is a pedagogic project that seeks to improve the internal quality of teachers' work (De Clercq, 2013). Professionalisation of teaching, on the other hand, is a sociological project that seeks to improve teachers' working conditions, as well as increase their status and collective power over their work (De Clercq, 2013; Hargreaves, 2000). Professionalism cannot be imposed on or demanded from teachers because concerns "what teachers do, how and why they do it; what they know and understand; where and how they acquire their knowledge and understanding; what attitudes they hold; what codes of behaviour they follow; what their function is; what purposes they perform; what quality of service they provide; and the level of consistency incorporated into the above" (Evans, 2011:855). Conceptualised in this way, teacher educators are important role-players in introducing and inducting pre-service teachers into the practices associated with professional teaching. Despite the increased bureaucratisation of teachers' work, the implementation of a skills-based performance management system and ongoing struggles to ensure that schools comply with the legislated norms and standards for infrastructure, numerous initiatives over the past twenty years have attempted to advance the professionalisation of teaching in South Africa. Initiatives to advance the professionalisation of teaching include the establishment of the South African Council for Educators (SACE) in 1997 to "enhance the status of the teaching profession, and promote development of educators and their professional conduct" (SACE, 2011). SACE is mandated to register teachers with a licence to practice (thereby opening possibilities for professional recognition) and to set professional teaching standards. In another example of an initiative that seeks to advance the professionalisation of teaching is the passing of legislation that moved the provision of ITE into the higher education sector (Republic of South Africa, 1997). All teachers need to qualify with an academic or professional degree, and pre-service teacher education qualifications (the four-year Bachelor of Education degree and one year PostGraduate Certificate in Education) focusing on "well rounded application of theory to professional practice" (DHET, 2015:19). Teacher educators are thus legislatively tasked with ensuring that pre-service teachers acquire the theoretical and practical knowledge that will enable them to "demonstrate competence and responsibility as academically and professionally qualified beginner teachers" (DHET, 2015:20). While this is identified as an important mission for teacher educators, little is known about how this endeavour to prepare teachers as professionals is enacted in South African pre-service teacher education programmes. This paper addresses the research question of how pre-service teacher education programmes offered in the South African context conceptualise and transmit notions of teacher professionalism to students. This paper reports on a part of the ITERP that analysed the Bachelor of Education and PostGraduate Certificate in Education programmes offered by five South African universities. Participating institutions differed according to their geographical location, their language of instruction, merger history, and resourcing legacies. Ethics approval for the study was obtained from the Human Sciences Research Council (HSRC) and the Ethics Committees of each institution. In each institution, semi-structured interviews were conducted with 10 to 15 teacher educators who teach on a range of courses, including education theory, content subjects and pedagogy. Interviews were also conducted with those involved in programme, course and practicum leadership. The participants were selected by the head/dean of education at each institution based on their academic leadership roles in their departments, their knowledge of the initial teacher education programmes, the courses they teach and their experience mentoring pre-service teachers during their practicum sessions. Each interview lasted 40 minutes, and detailed notes on the participant responses were recorded on a template during and immediately after the interview. Participants were provided with an opportunity to review the reports, in order to ensure that their contributions had been accurately captured. What are the key characteristics of a professional teacher? How does the curriculum offered by this institution seek to enable student teachers to become the kind of professional teacher envisaged? Using the characteristics of professionalism raised by lecturers, and with reference to their perceptions of where the curriculum addresses the professional development of teachers, the design and rationale of each institution's pre-service teacher education programmes was analysed. In particular, we drew on several sources of data that speak to the way in which the notion of teacher professionalism is transmitted to student teachers. These could be grouped into three main areas: through their expectations of students' conduct at university, through the formal university-based coursework offered to students, and through criteria used to assess the teaching competence of students during their teaching practicum sessions. To gain access to the espoused curriculum we analysed the official BEd syllabus and rules book, course outlines and study guides (where available). We also used the teaching practice assessment rubric to access criteria regarding the way in which professionalism is conceptualised and assessed during the practicum sessions. Maton's (2000, 2007, 2014) Legitimation Code Theory (LCT) provides useful conceptual tools to analyse how teacher professionalism is understood and transmitted through pre-service teacher education programmes. The Specialisation Dimension is based on the premise that "every practice, belief or knowledge claim is about or oriented towards something and by someone, and so sets up an Epistemic Relation to an object (ER) and a Social Relation (SR) to a subject" (Carvalho, Dong & Maton, 2009:487). Every message regarding teacher professionalism thus has both a social relation and an epistemic relation that can be stronger (+) or weaker (-) along a continuum. Ways in which messages about what legitimates teacher professionalism vary in terms of the strength of an epistemic relation towards a knowledge base. The extent to which teacher professionalism is socially related to who a pre-service teacher is as a person also varies. The relative strength of the epistemic relation to an object of study (in this case, teacher professionalism) interplays with relative strength of social relation (in this study, the subject as pre-service teachers) to describe four Specialisation Codes, which can be represented as a quadrant on a Cartesian plane as illustrated in Figure 1. 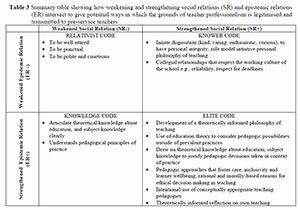 These codes describe the underlying structures that legitimise the conceptions of teacher professionalism transmitted: by virtue of who the pre-service teacher is as a person (a Knower code with a weaker ER and stronger SR), by virtue of what they know irrespective of personal attributes (Knowledge code with a stronger ER, and a weaker SR), by both what they know and who they are (an Elite code in which both ER and SR are stronger), or by neither (a Relativist code, where both ER and SR are weaker). The discussion will draw on empirical data to postulate what teacher professionalism would look like when governed by each of these codes. First, the concept of teacher professionalism was used as a sensitising concept to identify empirical data relevant to this part of the study. The empirical data deemed relevant was then analysed using the concepts from the Specialisation Dimension of Maton's (2007, 2014) LCT. Data that acknowledged prospective teachers as individuals who enter ITE programmes (with a unique combination of prior knowledge, constructed identity, and personal experiences of schooling, teaching and learning) were coded as having stronger social relation (SR+). The translation device shown in Table 1 has developed iteratively from the theory and tested and revised using empirical data. It defines three levels within a continuum from very strong to weak social relations in the context of this study. Secondly, the data was examined for notions of teacher professionalism that rely on an established theoretical knowledge in order to allocate an epistemic relation (ER) to the data. This, for example, included data that referred to the induction of student teachers into established academic, disciplinary and teaching practices that transcend the diversities associated with students' personal traits, identified as having stronger epistemic relation (ER+). The strength of the epistemic relation is defined on the basis of where the knowledge is produced, and how transferable it is across diverse contexts. The translation device in Table 2 defines three levels within a continuum from strong to very weak epistemic relations in the context of this study. The nature of this research as a case study introduces limitations in the data sets used, and as such, the findings of this study are provisional and not necessarily transferable to other institutions offering pre-service teacher education programmes. The purpose of this study is not to offer an evaluation of the different programmes, but rather to illustrate the different ways in which notions of professionalism in teaching have been transmitted to pre-service teachers. It is hoped that the analysis will illustrate how conceptions of teacher professionalism are transmitted to pre-service teachers through the curriculum, pedagogy and assessment of their ITE programmes. Messages about teacher professionalism were found to be transmitted to students through expectations of students' conduct, university-based coursework, and criteria used to assess their teaching competence during practicum sessions. Drawing on the literature review, the results of this study will be discussed in three broad clusters, namely: the dispositional and behavioural (attributes); the social (indicative of the communal values and collective ethical imperatives that underpin professional relationships that prospective teachers build in their practice); and the intellectual (which relates to the knowledge and understanding teachers have, and the choices they make on the basis of that knowledge). Teacher Professionalism as a Personal Attribute Lecturers from all five institutions asserted that the development of a professional identity is enhanced by students' 'desire to teach' and a 'commitment to the profession.' While some students who landed in teacher education programmes by default discovered a love of teaching as they participate in the practices, for most, this desire was an intrinsic one, akin to a vocational calling. Emphasis on the dispositional qualities of a prospective teacher reflects a stronger social relation to professionalism, and suggests that the ability to teach effectively cannot entirely be taught and learnt through formal instruction. Lecturers across institutions agreed that prospective teachers ought to have caring dispositions; be patient and enthusiastic; and 'have time for all learners' complaints and stories.' In addition, lecturers from just two universities went well beyond attributes about caring relationships with children to describe the 'ideal' dispositions of a professional teacher in terms of relationships to knowledge: an 'inherent curiosity,' a ' passion for the subjects they teach,' and an ' interest in understanding the way children think. ' The social relation of this message about being a professional teacher is relatively strong, but its epistemic relation is much weaker, because it is based on individual characteristics. Three universities require that pre-service teachers interrogate their personal experiences of schooling, however, there are significant differences in how they draw on formal concepts to guide this process. First-year students at one university are asked to articulate their philosophy of teaching. Given that students have acquired very little formal knowledge about teaching, their responses have much weaker epistemic relation. The basis of their judgment (such as decisions for lesson planning, teaching strategies and so on) is presented, from the outset, as legitimated by their personal value system. In two universities, pre-service teachers learn how policies and teacher unions have shaped the formation of teacher identities in South Africa. Identity, then, is presented not an individual journey, but a social one that forms as one appropriates practices and participates in conversations shaped by politics, policy and the priorities of a much wider community of teachers. Their journey of becoming a teacher thus has stronger ER and SR is weakened. Professionalism through Personal Conduct University environments prepare pre-service teachers to develop the 'professional behaviour' that is expected of them in their future workplaces. Certain norms of teachers' professional conduct are developed implicitly through teacher educators' expectations of how students are to conduct themselves on campus. For example, expectations like the on-time assignment submission policy, punctual start of lectures, zero-tolerance of plagiarism, integrity in completing assessment tasks, and the rooting out of discrimination result in an induction into the discipline and knowledge practices of academia, as well as a socialisation into the conduct expected of prospective teachers in their future workplace. Lecturers, particularly those from two universities, emphasised the importance of teachers being 'good' role models for the children. This reflects a stronger social relation but does not depend on any specialised knowledge. These norms for professional conduct can be learnt in the course of everyday life, and so have a weaker epistemic relation. In some universities, criteria in Teaching Practice (TP) assessment rubrics present 'professionalism' as the outer image that pre-service teachers project through their conduct, through their appearance and alongside aspects of their interactions with other school staff (such as the extent to which they are positive, respectful, loyal, courteous). Also included as sections of 'professionalism' are criteria that related to the way in which students worked within the school environment: whether they are organised, punctual, dependable, and participate meaningfully in the activities of the school. Although most TP guidelines alert students to the importance of complying with the SACE Code of Professional Ethics, these criteria are expressed in terms of expectations for appropriate conduct during school-based placements, rather than ethical imperatives that guide their classroom actions. 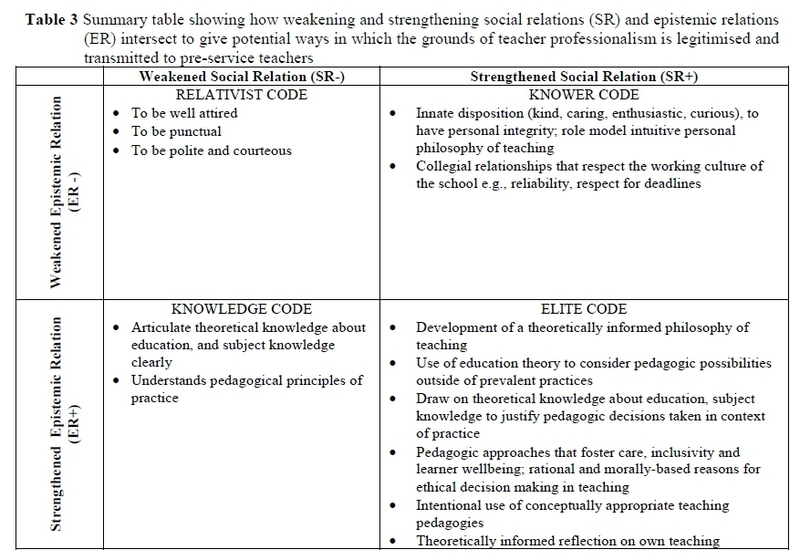 Such criteria both weaken the social relation and the epistemic relation of how teacher professionalism is understood. Teacher Professionalism as an Ethically-Driven Accountability to the Practice During interviews, lecturers from four of the institutions emphasised that understanding of the ethical imperatives that drive teachers' work is an essential aspect of developing their professionalism. These institutions offer coursework where concepts like ethics, ethical decision-making, morality and fairness are explicit objects of study. These modules draw on philosophical insights and therefore have a stronger epistemic relation than those emphasising compliance with conduct guidelines. Pre-service teachers in two of the universities study sociologically-orientated modules on the role schooling plays in reproducing or disrupting unequal power relations in society. Students are introduced to sociological gazes that potentially enable them to notice prevalent exclusionary practices in schools that they might otherwise have overlooked. They are invited to consider their roles (as future teachers and potential agents of reproduction or change) within existing social structures. This coursework seeks to create a cultivated gaze in which there are both stronger epistemic and social relations. Some evidence of an ethical orientation could be found in the teaching practicum assessment rubrics, mainly related to principles of inclusion and use of inclusionary pedagogies. One university merely requires that pre-service teachers have an 'accommodating attitude' towards learner diversity, however others expect pre-service teachers to ' make pedagogical choices that respond intentionally to diversities encountered.' The former is at the level of personal interaction, whereas the latter has implications for informed classroom action. This section considers the way in which ITE programmes transmit messages to pre-service teachers that their professionalism resides in specialist knowledge and their ability to use that knowledge to make reasoned pedagogical judgements in practice. Theoretical Knowledge of Education All five programmes studied contained courses that all pre-service teachers - irrespective of their phase and/or subject specialisation - are required to study as knowledge for practice (Rusznyak, 2015). A strong epistemic relation within the BEd degrees offered by different institutions is exemplified through compulsory modules on education, schooling, teaching and learning. All programmes contained modules that taught prospective teachers about generalised patterns of human development (typically including cognitive, social, moral and emotional development). In addition, all programmes included coursework on intrinsic and extrinsic barriers to learning commonly experienced by children. Just two universities include modules where the knowledge bases of teaching are an explicit object of study. In other programmes, these links are implicit and students are required to work out the links between different courses in their programme themselves. The way in which theoretical knowledge informs teaching practice is therefore less visible in these programmes, and may be a contributing factor in explaining why some teachers struggle to see how research and theory can strengthen teaching practices. Subject and Pedagogical Knowledge for Teachers All programmes included courses that seek to build the subject-specific knowledge of prospective teachers, although a comparative analysis of these courses has shown much variation in terms of time allocation and depth (Bowie & Reed, 2016). All programmes included a criterion in TP assessment rubrics about the content knowledge of students during the practicum, but the weighting varied considerably. In some, content knowledge exists as one of many points on a checklist, whereas in others, high levels of content knowledge constitutes a non-negotiable requirement on the basis of which competence in teaching depends (Rusznyak & Bertram, 2015). Whereas criteria at two universities stipulated that the students' subject knowledge should be 'sound,' 'sufficient,' 'thorough' and 'accurate,' others specify what student teachers are expected to do with that knowledge. For example, comprehensive and well-organised conceptual knowledge ought to enable students to 'foreground main ideas' and 'develop content logically and systematically,' draw on 'appropriate examples from the real world,' and use their knowledge of the subject/topic to inform their justification of pedagogic choices. Subject knowledge is thus not merely one of many aspects needed for competent teaching, but constitutes a basis for important pedagogical choices. In the coursework offered by four universities, pre-service teachers undertake subject-specific pedagogy courses. The use of subject knowledge as a basis for professional judgment is potentially enhanced though subject-specific pedagogy courses, where students are required to account for the pedagogic decisions made in relation to the topic being taught. These potentially establish opportunities for the construction of PCK, however the extent to which students are expected to make knowledge-based pedagogic decisions in their teaching varies across institutions. The importance of students' developing professional judgment is minimised in subject methodology courses that focus exclusively on using pre-developed material to rehearse for confident lesson delivery. Opportunities to develop teachers' professional reasoning are created when pre-service teachers are required to interrogate the selection and sequencing of the knowledge they teach. It is further developed when opportunities are created for them to critical analyse the way in which conceptual knowledge is represented in learning materials, and evaluate the value of the learning opportunities constructed by learner-based classwork and assessment tasks. Furthermore, opportunities for developing pedagogical reasoning are restricted when criteria in the teaching practicum assessment rubric are expressed as technical application of particular strategies rather than in relation to a conceptually informed judgment about the appropriateness of a strategy in a particular situation (Rusznyak & Bertram, 2015). Although during interviews, teacher educators from three universities stressed the importance of students learning to justify their pedagogic decisions, the justification of pedagogic choices is a lesson planning requirement and a formal criterion in the TP assessment instrument at only one of the participating universities. The ability of a student to account for the grounds upon which the pedagogic choices are made is enabled by criteria such as ' [evidence that the student] thoughtfully selects and effectively uses a variety of teaching and learning strategies appropriate to content and learners,' that he/she has the ' ability to reflect in action, and change tack if necessary to do so' and can 'justify reasons for pedagogic choices.' Reflection in and on teaching is required by students at all institutions during their practicum sessions. Students are sometimes provided with specific questions to guide them through a reflection process. The use of concepts to inform their reflection can range from trial-and-error (ER-) or through conceptually guided thinking (ER+). The analysis of the different ways in which professionalism is transmitted to pre-service teachers through five ITE programmes shows that conceptions of teacher professionalism are transmitted through the expectations teacher educators hold of student conduct, the demands in assessment tasks, knowledge selected for inclusion in coursework, the requirements for success during the practicum and the criteria on practicum assessment instruments used. The analysis shows that all five institutions work with conceptions of teacher professionalism as having a relatively strong social relation. However, the extent to which a strong epistemic relation is transmitted as a criterion for what constitutes teacher professionalism differed greatly between the five programmes analysed. I will use the results of the findings to consider hypothetical ways in which the messages of what constitutes teacher professionalism revealed in the analysis of data can be combined to legitimate professional teaching primarily within Relativist, Knower, Knowledge or Elite codes as described by Maton's LCT framework. A summary of the analysis is presented in Table 3 below. In the discussion, I look at the potential for advancing the professionalisation of teaching when the SR and ER of the criteria legitimising teacher professionalism are weakened and strengthened. The criterion that measures teacher professionalism by appearance and dress code has neither social nor epistemic relation. It would thus exemplify teacher professionalism conceptualised as a Relativist Code (where both ER and SR are weakened). If teachers emerge from ITE programmes believing that their appearance, punctuality and demeanour is primarily where their claim to professionalism lies, they would possess a restricted understanding of the intellectual work of professional teaching. These traits, while not unimportant for teachers, are similarly expected of any other occupation that provides a public service. It provides a deficient way of conceptualising the nature of teacher professionalism and consequently cannot contribute to the systemic improvement of teaching across the education sector. An ITE programme that locates teacher professionalism in a Knower code (where ER is weakened, and SR is very strong) is concerned with producing a graduate with the 'right' kind of attributes. The importance of personal disposition and conduct is foregrounded in practicum assessment, and the programme would create opportunities for each pre-service teacher to follow a unique development trajectory that is effectively unchartered. Prospective teachers would be taught that their professionalism lies primarily in their natural disposition, their personally-acquired practical knowledge, and gaze on practice that is cultivated through immersion in the field of practice. This would require extended apprenticeship in the sites of practice, where personalised learning through personal reflection based on experience alone would be valued over insights enabled by theoretical knowledge. Without the lens of theory, all views and perceptions are regarded as equivalent, and there is no recognised authority, despite evidence and/or research that points to some perspectives being more generative than others. Inducting pre-service teachers into a practice where every option is as good as the next means that they do not have access to ordering principles that enable them to distinguish the priorities between the competing demands they inevitably face in their day-to-day practice. Constructing teacher professionalism in this way creates an impression that professional teaching is more about the qualities of teachers as individuals than about being part of a collective that strives for shared excellence within their schools, districts and the education system more broadly. Without understanding that the practice is based on a shared knowledge base and a shared commitment to an ethical imperative, pre-service teachers could leave an ITE programme thinking that their professionalism resides in their disposition and conduct, rather than in drawing on a knowledge base to make conceptually informed judgments. With the focus on individual attributes, attention is deflected from teaching as a communal knowledge-based practice, and the potentially exclusionary structures in which teachers practice. It thus offers limited potential for opening up ways of building a community of highly effective teachers capable of transforming an under-performing education system. ITE programmes that conceptualise teacher professionalism as a Knowledge Code (where ER is strengthened, and SR weakened) would emphasise the existence of a specialised knowledge that transcends individual differences between members of a practice. The competence of a professional teacher would exclusively depend on how much they know and how that knowledge enables them to achieve the purposes of the practice. Legitimating teacher professionalism as a Knowledge code would mean admission to an ITE programme based exclusively on whether applicants could cope with the academic demands of the programme. Their motivation, commitment or dispositions would be inconsequential for admission, and would not be valid grounds for assessment during the programme. Were an ITE programme to legitimise teacher professionalism exclusively in a Knowledge code, the experiential knowledge of classroom life and systems of meaning that prospective teachers bring into their ITE programmes would be deemed irrelevant. Samuel (2009) usefully points out that ignoring the social relations that pre-service teachers hold towards teaching is likely to alienate them from ITE coursework, and severely constrain their appropriation of practices. This conception of teacher professionalism ignores what De Clercq (2013) identifies as being part of what is crucial for meaningful professionalisation of teaching in the South African context: attention to teachers' beliefs, values, and professional identity. Attempts to understand teaching exclusively from a base of abstract professional knowledge ignores the individualise artistry of teaching (Hargreaves & Goodson, 1996; Sockett, 2008). Teachers' personal mission, beliefs and disposition influence their thinking and behaviour in a classroom in both conscious and unconscious ways, such that teachers' practice can neither be hyper-clinical nor purely rational (e.g. Flores, 2006; Korthagen, 2004; Palmer, 2007). A knowledge focus can therefore support but never be sufficient for a practice that, like teaching, is driven by ethical imperatives for learner wellbeing and social justice. In this analysis, an Elite Code (where both social relation and epistemic relation are strengthened) offers the greatest potential for advancing the professionalisation of teaching. It bases its conception of teacher professionalism in both specialist knowledge, and a cultivated gaze that enables a teacher to understand and be responsive to the complexities of classroom life. Pre-service teachers would be taught that there are rational reasons why certain approaches and strategies are more appropriate than others. However, their classroom action ought not to be entirely informed by teaching protocols, but also by what is appropriate given their context and the learning support needs of the children they teach. Principles arising from academic knowledge (including content knowledge, educational theory and pedagogical knowledge), personal dispositions, and experience can be used as a basis for conceptually informed professional judgments that are both ethically driven, and responsive to diverse contextual realities. While acknowledging the varying experiences of teaching and learning that pre-service teachers bring into their ITE programmes, this approach seeks to provide a knowledge base that supports practice, and provides ample opportunities for pre-service teachers to generate conceptually informed rationales for their pedagogic choices and judgment in simulated or actual practice-based contexts. Although teacher educators are expected to prepare teachers as prospective professionals, newly qualified teachers begin their teaching careers in a system characterised by high pressure for bureaucratic compliance, performance management and highly prescriptive curriculum and assessment requirements. Intentionally building ITE programmes with conceptual coherence around the idea of teacher professionalism as an 'Elite' code creates conditions for possibility for preparing teachers that can develop the "teacher mindset and behaviour to take responsibility for the quality of their teaching and school education as a whole" (De Clercq, 2013:18). Advancing professionalism in the South African context requires "deep changes in the intellectual knowledge, mindset and values of teachers" as well as for teachers to develop "stronger professional identities and responsible commitment to learners and quality school education" (De Clercq, 2013:18). However, the professional preparation of pre-service teachers will not make an impact on the education system if the most capable newly qualified teachers are expected to work in environments where they are unable to practice as professionals; where scripted lessons is the norm and further development of their pedagogic reasoning is restricted. The recent initiatives by SACE to begin the development of standards for professional teaching has the potential to open up important conversations amongst practicing teachers about the intellectual basis of their practice, the ethical imperatives and the pedagogic reasoning that their work demands. If these initiatives are merely designed to impose further technical, bureaucratic or performance management obligations on teachers, their potential for advancing teacher professionalism will not be attained. The intentions to develop a supported induction period for newly qualified teachers also has the potential to open spaces for new and mentoring teachers to talk about the pedagogic choices they make in their practice. This paper has argued that the ways in which teacher professionalism is conceptualised and enacted in ITE programmes has important implications for how prospective teachers come to understand and embody their practice. If the quality of professional teaching is to be improved systematically across the sector, pre-service teachers ought not to qualify accepting that becoming a professional teacher is a matter of merely ensuring that they comply with a code of conduct, are patient with learners, and are appropriately attired. A more robust view of teacher professionalism demands consideration of the ethical imperatives that guide relationships and practice, the thoughtful use of theoretical knowledge in response to contextual demands, and personal development that builds capacity for discernment in practice. Teacher educators need to be cognisant of the ways in which they intentionally prepare (and don't prepare) prospective teachers as knowledgeable, thinking practitioners who subscribe to a collective ethical imperative to act in the best educational interests of their learners. This paper has shown how these messages can be embodied in various ways in the coursework and practicum requirements of ITE if pre-service teachers are to qualify with a deep understanding of the nature of their work as prospective professionals. The author acknowledges the ongoing support of the UNESCO Chair Forum in Teacher Education for Diversity and Development. This work is based on the research supported wholly/in part by JET Education Services and the National Research Foundation of South Africa (Grant Numbers 109224) - https://doi.org/10.13039/501100001321.